Now that back-to-school season is in full swing, it’s time to think about what to pack for lunches. The food you choose to pack in your kids or your own lunches is obviously important to provide the healthy nutrients your bodies need – but the things you use to pack those lunches is equally important. If you were to keep the wrappers from pre-packaged food that you sent in lunches over a month, it would likely be shocking to see how much was going into the garbage, and ending up in landfills. Packing a litterless lunch doesn’t have to be difficult – your health and the environment will thank you! 1. 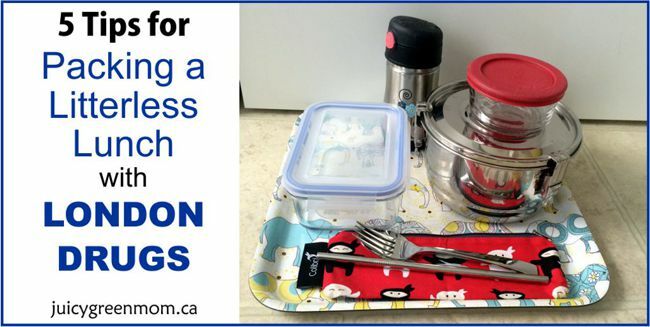 Choose reusable containers, preferably glass or stainless steel. I have now switched our family over to using glass or stainless steel for all food storage, because even BPA-free plastics can still be leaching toxins into your food (here’s my infographic on decoding plastic codes), especially if you are re-heating it in the container. London Drugs has sets of Glasslock containers that are very reasonably priced. Anchor Hocking and Pyrex also have glass containers with lids. Another trendy and frugal glass container option is a mason jar – you can get lots of cool accessories to convert them into salad and drink containers. For something more lightweight, Onyx has a wide variety of all stainless steel containers, even some with dividers or tiny dip containers to accommodate any type of lunch you want to pack. If you want to keep your lunch hot, a stainless steel thermos is your best bet (plus it will keep it hot much longer than a plastic one). If you would rather opt for plastic, do try to check your plastic codes, and only pack things in plastic that you won’t need to reheat. This little bento box set is perfect for packing lots of variety for kids who need choices! 2. Choose reusable utensils and straws. I have a reusable snack bag that I keep cutlery in for taking with lunch. Onyx has a super cute and affordable stainless steel cutlery set for kids (I would totally use these as an adult too!). Plastic straws are another huge source of waste caused by a one-time use product. Stainless steel straws are a great alternative that you can keep with your cutlery, and are easy to clean. There are also glass and bamboo straws out there. I keep one along with cutlery in a snack bag and take it with us when I know we are going to eat out and can avoid using disposable cutlery and straws. 3. Choose reusable and toxin-free accessories. If you want to keep your lunch cold, you don’t have to use a plastic ice pack – Onyx has a stainless steel ice pack that is perfectly safe for putting right into your lunch container! Instead of using zip lock baggies, invest in a few reusable sandwich and snack bags that you can rotate through the week. There are lots of styles and designs out there! If you’re in a hurry to pack dinner leftovers, you can also use cover blubbers instead of plastic wrap – these stretchy things conform to fit whatever container you’re covering up! 4. Make your own snacks. Pre-portioned snacks are super convenient, but have so much excess packaging. Instead of buying lots of pre-packaged stuff, try making big batches of things and portioning them out yourself. I love making a big batch of granola bars with my super versatile granola bar recipe, and they usually last us over a week. Trips to Bulk Barn or Costco are great for getting things in bulk to reduce packaging. I buy things like apple chips, dried cranberries or raisins in bulk and store them in big mason jars in my pantry. I portion them out into a few containers or reusable snack bags at a time so they’re easy to grab and go. I hope these tips for packing a litterless lunch help you pack safer and earth-friendlier lunches for your families! 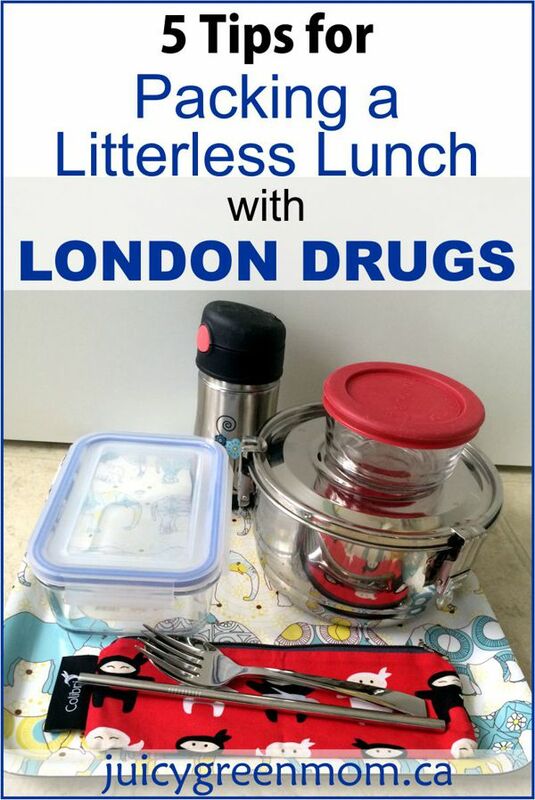 What’s your best litterless lunch tip?